In my previous post on Play the Past I introduced the idea of virtual prisons, noting that prisons appear in videogames as either spaces of confinement or spaces of control. In the first kind of game, the player tries to escape the prison. 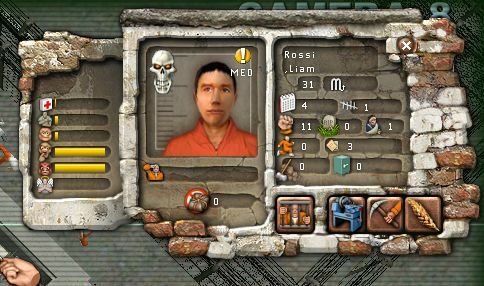 In the second kind of game, the player tries to manage the prison. While I mentioned the jails in SimCity as an example of the latter case, those jails are merely one variable in a complex urban ecology, a function in a game algorithm that also includes power plants, hospitals, police stations, freeways, and so on. The jails in SimCity do not teach us anything about jails, about their management or their occupants. Nor does SimCity try to do so. But now I want to turn to a game obviously influenced by Will Wright’s work but which focuses directly on prisons themselves: Prison Tycoon 2. You might think of Prison Tycoon as The Sims: Prison Edition. As the game manual explains, “Build and run your very own correctional facility from the comfort of your own home…with even greater attention to detail and realism!” Unlike SimCity, Prison Tycoon 2 (and there are actually four games in the series) was never a bestseller. It’s a budget title, the kind you might find in the discount rack at Target—which in fact is where I found my copy. The game is ridden with bugs and laden with a clunky interface. Yet, I think the game is representative of what we might call a simulation sensibility, the idea that there is nothing that can’t be modeled by a computer and played by a human. I’m going to set aside for a moment the poor gameplay and instead focus on how this game operates in the intersection between containment and control. Or, to frame the game using the terms from Gilles Deleuze that I introduced last month, Prison Tycoon is a simulation about disciplinary society expressed through a medium befitting a society of control. The game begins as many simulations do, with a blank slate, in which your prison has yet to be built. Choosing among cellblocks, laundry rooms, administrative offices, guard towers, factory shops, chapels, infirmaries, exercise yards, mess halls, and so on, the player eventually creates a toyworld prison, which is soon populated by inmates of varying degrees of unsavoriness. What I want to call your attention to is how Prison Tycoon abstracts the prison from its historical and sociological context. Yes, once the prison is built, an astonishing number of variables play against each other as the game’s algorithm calculates prisoner unrest, rates of rehabilitation, gang warfare, etc. But these variables are all inward-directed, self-contained, referring to the prison world as if the prison were all the world. There is nothing before nor after the prison. Just as videogames about interrogation eliminate prisons, this prison game eliminates everything but itself, erasing the social processes that brought the prisoners to the prison. The procedural rhetoric of the game suggests that crime is inevitable yet without origins. There are many other salient features of Prison Tycoon worth exploring, but I want to look at just one more. This is the way the prisoners themselves appear in the game as data items. Using the game’s management panel, it is possible to see a list of every prisoner, along with vital statistics about each one. 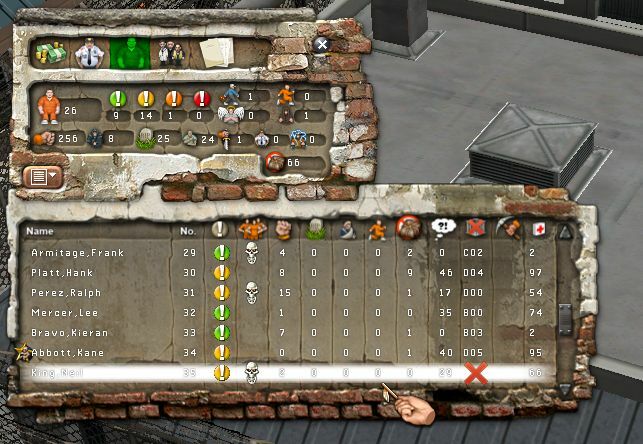 From this control panel, the player can drill-down further to see an individual inmate’s status. Here we see a prisoner named Liam Rossi. His file tells us that he has been in eleven fights with other prisoners, has attacked one guard, is a gang member, and has an “anger” level that is reaching a critical state while his likelihood for rehabilitation is zero. What we have here in these accumulated datasets is a high-tech version of what Michel Foucault calls a “case,” referring to the way “disciplinary writing” in institutional contexts constitutes the individual as a “describable, analyzable object” (190-192). And indeed, Rossi is only an object, as are the other prisoners, and in fact, as are the guards and staff as well: they are all modular components subservient to the game’s algorithm. So modular in fact, that it turns out that they are interchangeable from one game to the next. That is, in this run of Prison Tycoon Rossi might possess certain characteristics while the next run he may have completely different attributes. Even his race his unfixed: this game he is Latino, but in the next run of the game the same name might be attached to a black prisoner. His name may even be attached to a white prisoner, superficially at least defying Lisa Nakamura’s concept of “cybertypes”—the signifying of race, gender, and ethnicity in virtual realms. I’ll save the rich discussion of race and gender in Prison Tycoon for another day (or the comments? ), but for now, I want to suggest that this fungibility contributes to what Ian Bogost calls a “simulation gap.” Bogost describes a simulation as “a representation of a source system via a less complex system that informs the user’s understanding of the source system in a subjective way” (107). Just as it’s impossible for a map to match detail for detail the territory it represents, so too is the simulation bound to be irreconcilably impoverished compared to the system it simulates. This differences leads to the simulation gap: the “gap between the rule-based representation of a source system and a user’s subjectivity” (107). Especially when it comes to understanding a game like Prison Tycoon, this distance between the computer model and the user’s own experience or understanding of the source system being modeled is a good place to begin questioning the game’s algorithms and the procedural models it employs. In the case of Prison Tycoon, everything from the self-contained prison toyworld to the unstable representation of the prisoners in that world bears scrutiny. And the stakes are higher with virtual prisons than with most game simulations, because virtual prisons have real world counterparts, for which the cost of misapprehension is simply too high. Bogost, Ian. Unit operations: An Approach to Videogame Criticism. Cambridge: MIT Press, 2006. Foucault, Michel. Discipline and Punish: The Birth of the Prison. Trans. Alan Sheridan. New York: Vintage-Random House, 1977. This is about ‘play’, but what about ‘the past’? Pluperfectionist – While the site is called Play the Past, you’ll note that our mission is more broadly conceived as exploring games and cultural heritage. And you’d be hard-pressed to argue that maximum security penitentiaries are not part of our collective cultural heritage in the states. OK, I guess if representations of contemporary society count as cultural heritage, then the remit is broader than I thought. Is the objective of this game normally to create a large population? Do prisoners leave (or are they all lifers)? If so, can the player influence how soon or whether this happens? I like that you point out the ahistorical context of Prison Tycoon and how this might be problematic. Lacking a connection with any kind of real-world social or cultural system, it makes it easier to look past the superficial aesthetics of orange jumpsuits and crumbling brick to see the way that ideology is played out on a procedural level (once again, looking to Bogost’s work). I find it particularly interesting to compare Prison Tycoon to another game with a very different aesthetic and a very different historical context, Tropico 2: Pirate Cove. In Tropico, the player is situated in a very well-defined time and place and presented with a humorous, tongue-in-cheek attitude that prevails throughout the game. The island is essentially a huge prison, but the prisoners are not criminals, but rather kidnapped sailors and townsfolk exploited by the ruthless pirates. Though Tropico is in some ways a complete reversal of Prison Tycoon, with the murderous outlaws as protagonists, the two games’ mechanics are surprisingly similar, with prisoners as cogs in a huge machine, meant to be kept in line by persuasion or by force. When the roles of guard, pirate, captive and criminal become as interchangeable to the gameplay as the particular gang to which Rossi belongs, we are left with an interesting social critique of what we believe are the most defining features of a prison. Peter – Steal my thunder, why don’t you? Seriously, though, you’re dead on about Tropico, and in fact, I’ll be talking about that game in my next post here—especially that reversal you mention. Oops…and here I thought I was referencing one of the more obscure sim games out there. I am excited to see your take on the whole “prison as exploitation for fun and profit” angle, though. Great article! Having not played the game, the screenshots of the interface were very striking. You start out with a blank slate, able to design the layout of the prison however you like, and — of course — the GUI implies that you would start out building something made of dank, crumbling bricks.